Very very sad news for the BMW family! Munich. The week before last week, Michael Ninic, who held the position of Head of BMW Car Interior Design for many years, died unexpectedly at the age of 53. 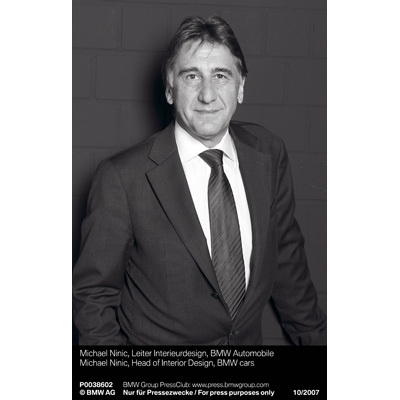 Ninic, who joined the BMW Interior Design Team in 1987, was appointed head of the department in 1999. In 2001, the department also became responsible for material and color design. Michael Ninic’s work has had a major influence on the design of BMW cars for almost twenty years of his active involvement with BMW Group. Before he started his career with BMW Group, Ninic, who was German-born, already had professional experience as a designer for German car manufacturer Audi and had also worked for Porsche Design. Over almost twenty years, Ninic’s innovative design developments have successfully enhanced BMW Interior Design’s formal scope of expression. His influence set new standards in the comfort and ergonomics of BMW car interiors. Among his most outstanding achievements are the interior design of the hand-crafted BMW Z8 Roadster, launched in April 2000, and the interior design of the BMW Concept CS presented in Shanghai. Ninic developed a particularly clear design for the BMW Z8 interior, which makes the typical BMW characteristics come alive in interplay between sporting appeal and a specific sense of space. “When he designed this cockpit, Ninic created a special relationship between the car and its driver.“ Chris Bangle, Head of BMW Group Design commented then. “Driving a BMW Z8 is almost like riding a motorcycle, all you see is the road that stretches ahead of you.“ The distinctive interior design makes the BMW Z8 a car for aficionados, Bangle said. Last year, Michael Ninic successfully added spectacular highlights with a completely new aesthetic design of the BMW Concept CS. As a modern answer to pompous opulence, Ninic’s design concentrated on focused luxury. When Michael Ninic and his team introduced the innovative technique of “layering design“, they allowed a new approach to arranging functional elements and the stylish reduction of form. Cut lines, for example, took on a completely new meaning when they were enhanced with functions such as ventilation and ambient lighting. The new structure was also perfectly suitable for introducing innovative materials such as ceramics to control elements. Beyond his work as a designer, Head of Interior, Material and Color Design, Michael Ninic was a role model and inspired those he worked with. He attached great importance to imparting his knowledge to younger colleagues. His team and the entire BMW Group Design department are deeply grateful to Michael Ninic for his achievements. Michael Ninic’s new standards in interdisciplinary work and design development will affect the design of future BMW models. Thus, his creative work will continue as a steady influence on future developments in the interior, material and color design of BMW cars. A successor to Michael Ninic as Head of BMW Interior Car Design has not yet been appointed. In the meantime, Adrian van Hooydonk, Head of BMW Car Design, has temporarily assumed this position in addition to his existing responsibilities.